Citation: C N Trueman "Sir Walter Raleigh"
Sir Walter Raleigh was an Elizabethan explorer and scholar. Sir Walter Raleigh advocated the colonisation of what we now call the United States of America and, for right or wrong, Raleigh will always be associated with the introduction of the potato and tobacco into England. 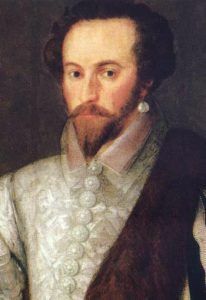 Sir Walter Raleigh was born around 1554. His father was also called Sir Walter Raleigh and the boy was born into a degree of affluence. He attended Oriel College, Oxford University and went to the Middle Bar. To all intents a career in law seemed almost a natural occurrence. However, this was the era of the Revolt of the Spanish Netherlands and by 1569 Raleigh was fighting for the Huguenots against the Spanish. In the next decade he fought against Spanish shipping. He came to the attention of Queen Elizabeth when Raleigh fought against the Munster rebels between 1580 and 1581. From 1581 on, Raleigh was a frequent visitor to the Royal Court. His charm, wit and debonair manner made him a favourite of the Queen. Elizabeth bestowed on Raleigh monopolies and offices and in 1585 knighted him. In 1587, Sir Walter Raleigh was made Captain of the Queen’s Guard – a prestigious position that also showed how much the Queen trusted him. Despite his military reputation, Raleigh was also a scholar and thinker. He was an early supporter of colonising America – though he viewed such a venture more for its trade benefits as opposed to anything else. Between 1584 and 1589, Raleigh sent a number of expeditions across the Atlantic though none were successful. He attempted to establish a colony near Roanoke Island on the coast of what is now North Carolina but what was then called Virginia in honour of Queen Elizabeth, the Virgin Queen. Raleigh had a major fall from grace when he secretly married Elizabeth Throckmorton, a Maid of Honour to the Queen. Elizabeth would have expected to be consulted about such a marriage especially as the other Elizabeth was one of her Maid’s in Honour. Such was her anger, that the Queen ordered the imprisonment of Raleigh and he was effectively ostracised by the Royal Court until 1597. However, rather than bide his time, Raleigh set off on a series of explorations. His main aim was to find El Dorado, the legendary city of untold wealth. Though he did not find this, he did explore about 400 miles of the valley of the River Orinoco in Venezuela. In 1596, Raleigh attacked Cadiz, probably the most important of Spanish ports and in the following year, in a jointly led campaign with the Earl of Essex, Raleigh attempted to attack a newly formed Spanish Armada. This was a military failure but a clear statement of intent. The accession of James I in 1603 ushered in an era of uncertainty for Raleigh. It is generally accepted that despite Elizabeth’s anger at having been kept out of the picture regarding his marriage, she had a ‘soft spot’ for him and for that reason he was safe while the Queen was alive. James, from Scotland, had no connection with the lifestyle of Raleigh. On July 17th, 1603, Raleigh was arrested and charged with assisting Spain in attempting to put Arabella Stuart on the throne. At his trial in September, Raleigh was found guilty and sentenced to death. However, the evidence against him – possibly cobbled together by the Earl of Salisbury who viewed Raleigh as a rival – was so weak that he was reprieved but imprisoned in the Tower of London. Here, free from distractions, Raleigh indulged in scientific experiments and writing. In 1614, Raleigh completed ‘History of the World’. Despite being a prisoner in the feared Tower, he lived a comfortable lifestyle with his family, though he could not actually leave the fortress. In 1616, Buckingham used his influence over James to secure Raleigh’s release to lead an expedition to Guiana to search for gold. James, forever short of money, was clearly attracted to the idea of his wealth being enhanced. However, wary of Spain, the king ordered Raleigh not to interfere with any Spanish possessions. Raleigh’s men attacked San Thomé – Spanish territory. He may have been forgiven if he had returned with gold but he returned to England empty-handed.